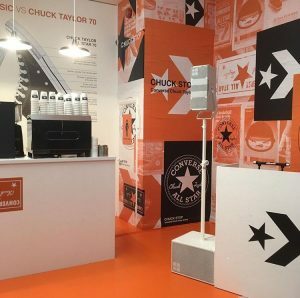 This week our team of baristas hit the road to Central London, where we worked with Offspring to deliver a pop-up café experience, ‘Chuck Stop’ for the launch and collection day of a new line of Converse trainers – ‘Off White Chuck 70’. 2000 sneaker fans waited in anticipation at Selfridges in London to collect their ‘Chuck 70’s’. These trainers were in high demand as only 2000 pairs were made available. Once they collected their new shoes they were given a voucher for a free coffee, bagel and milkshake at a pop-up store 5 minutes walk away. The store was previously a barber shop and in 24 hours it was given a complete makeover and the transformation was incredible. 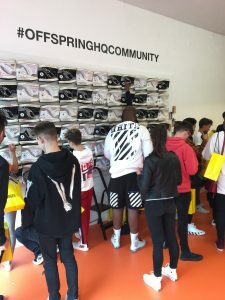 A sneaker wall was set up full of converse trainers and it allowed the online community to meet face to face with people they previously only knew as usernames. A photographer was on hand taking pictures of all the action and this was all posted online in real time. The fans then made their way to the store where we were waiting for them with five of our best staff, a DJ, 800 bagels, 1000 coffees and 500 milkshakes. This gave the Offspring community a chance to hang out with fellow brand ambassadors and talk trainers. Accordingly, the event was a huge success, with long lines of people queuing down George Street with people stopping as they went past the store wondering what all the fuss was about. We thoroughly enjoyed working with Offspring and it was a real education in how to look after your clients and create a raving fan culture.